Maintenance updates with bug fixes and small functionality changes. That kind of updates is free and will be available to all who already have purchase the product. New application major product versions that will be available for purchase. 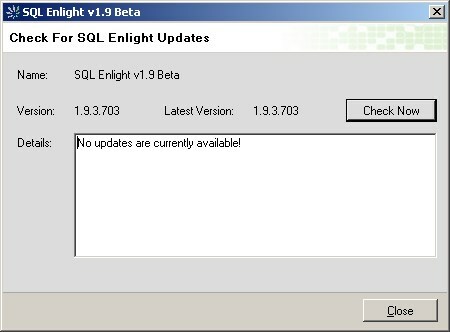 If configured SQL Enlight will check periodically for updates and will notify the user when a newer version is available. Enabling of the Automatic Check for Updates can be done at the Settings->General Settings->Updated tab. On the SQL Enlight menu, click Check for Updates. On the Ubitsoft Update dialog box, click Check for Updates. If an update is available information about the update is shown and a link Go to download page is displayed.